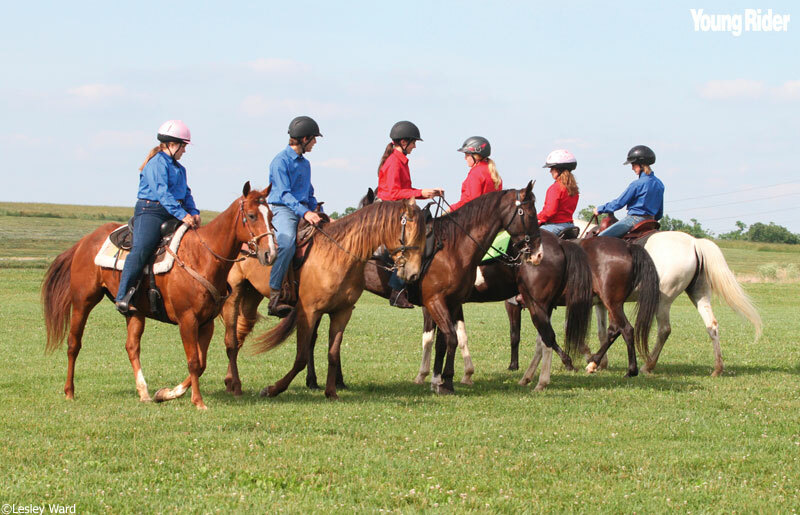 Joining a drill team can be one of the most fun things you will ever do with your horse or pony. One of the best things about drill teams is that they are open to anyone who has a horse. You don’t have to ride the fanciest or most expensive horse in the barn to join a drill team—you just have to have a fairly obedient horse that loves to get out and strut his stuff! Although some super-competitive teams might want horses that look similar, most drill teams accept horses of any breed, color or size. Is there a drill team for young riders in your area? 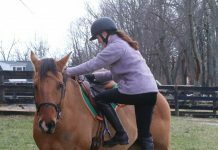 Many 4-H riding clubs have teams, so contact your local 4-H riding club leader. You should be able to get her contact information from your county agricultural extension officer. You might also see a drill team perform at a local show or horse expo. If you do, don’t be shy. Find out who is in charge of the drill team and how you can sign up to be a member. If your area doesn’t have a club, maybe you could start one! All you need is an enthusiastic group of young riders like yourself and a place large enough to practice. A lot of drill teams meet up once a week in the warmer months to practice at their county’s fairground. It’s best to ride in a large, flat field with plenty of room for lots of horses and riders to lope and gallop safely. It’s also essential to have a coach, someone who has drill team experience and knows the various drills and formations inside and out. The goal of many drill teams is to compete against other drill teams—and win a ribbon or two in the process! If you’re a member of a 4-H drill team, it’s likely your team will compete at county fairs or shows to qualify for your state’s 4-H show. If your team qualifies, you’ll pack up your matching outfits and saddle pads and travel to the state show to compete against the best drill teams in the state. So what sort of skills does a drill horse need? We asked Caycee Shimfessel, 15, of the Clark County 4-H Drill Team in Kentucky. “A good drill team horse has to be OK with working close together with other horses,” says Caycee. “You’ll definitely be hitting knees with other riders! The horse has to be OK with passing other horses, and he should stay pretty calm in groups. Does the size of your horse matter when joining a drill team? Not at all says Caycee. Caycee thinks that horses are ready for drill team when they are about 7 or 8 years old. Caycee’s American Quarter Horse, Cassie, is a drill-team pro. At 13, she has been in many demonstrations and competed at lots of county fairs. “By the time I’m ready to go to the state fair, Cassie can do the drills on her own,” admits Caycee. We asked Caycee if her team had ever had any drill team disasters. A good drill team horse must also be able to rate. You should be able to slow down and speed up your horse instantly before you sign up for a drill team. Caycee carries a whistle around her neck because she’s a “whistle person.” The whistle is blown to give direction to the drill team, for example when the riders must change direction or start a maneuver. Start with three or four horses at first and line up side –by-side with your saddle horns in a row. Start at the walk and stay slightly spaced out until your horses get used to being next to each other. If all of the horses are being well behaved, move closer to each other until your legs are almost touching. Once you’ve mastered straight line abreast at the walk, give the jog and the lope a go. If you’re practicing in an arena, begin by riding the horses on the rail one right after the other. Your horse’s nose should be pretty close to the horse in front’s tail. This is why it’s important that drill horses be easy going and not likely to kick other horses. Stay in this formation by looking through your horse’s ears at the tail of the horse in front of you. Practice riding in circles and in serpentines. Your next exercise will be from riding single file to riding side- by-side in pairs. The team rides single file down the centerline and when they reach the end of the arena or marked-off field, the first rider turns left and the second rider turns right. The rest of the line continues to alternate right and left and when the two lines meet at the centerline again, the first and second rider pair up, the third and fourth rider pair up and so on. Drill team members ride single-file along the rail and turn their horses toward the center of the arena or field transitioning from riding nose-to-tail to riding next to each other or abreast. When the riders reach the other side of the arena, they turn in the opposite direction and begin riding nose-to-tail again. To find out if there is a drill team in your area, visit www.useda.us or contact your local 4-H riding club leader. This article originally appeared in the September/October 2014 issue of Young Rider. Click here to subscribe.